With the Silverlight tool, you can create some powerful web applications. 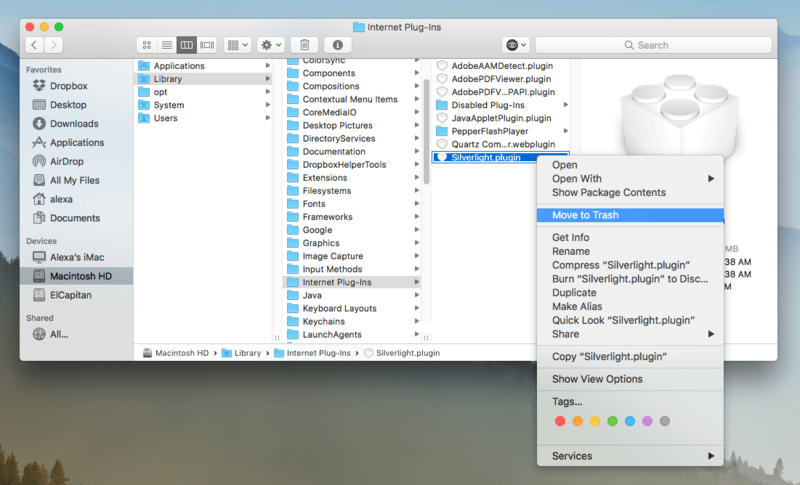 For running such apps on a Mac OS, Windows or Linux, you need a suitable plugin for Silverlight. But if you installed the program by mistake and now want to remove it, here are 2 ways to uninstall Silverlight on Mac. Uninstall Silverlight using App Cleaner & Uninstaller. As we mentioned before, Silverlight is a plugin, so to remove it, you should go to the Plugins subfolder in the Finder. Open the Finder → go to Macintosh HD → Library → Application Support → Microsoft and remove the PlayReady and Silverlight folders from there. 3. Then go to the Internet Plug-Ins folder and remove the Silverlight.plugin file. 4. Please note, despite the fact that Silverlight is a plugin and it should be stored in the Internet Plug-Ins folder only, it also creates the alias file, which is stored in the Applications folder. So then you have to remove the Microsoft Silverlight alias file from there. The developers claim that, even after removal of these files, Silverlight will be uninstalled completely. 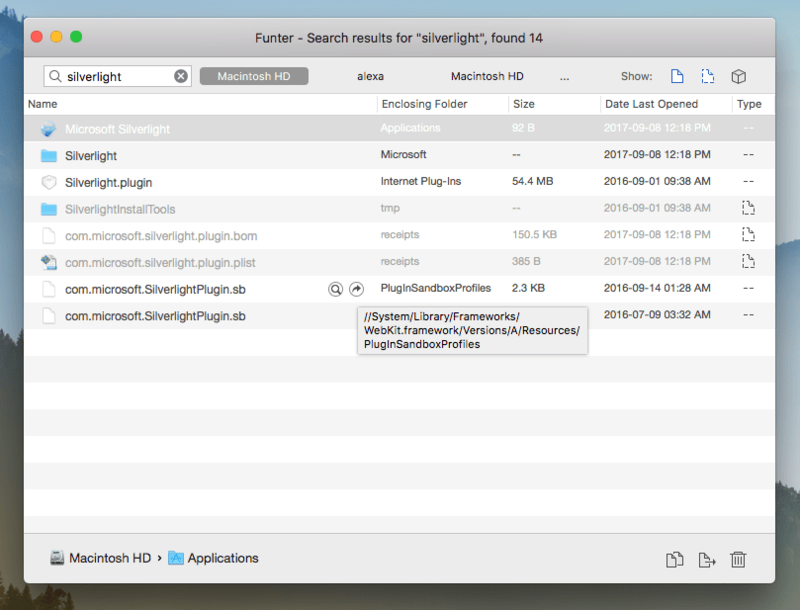 However, we decided to check, and searched for the Silverlight files via a free application Funter, which finds any file, including hidden files. The results show that there are other Silverlight files scattered in different locations. You can open each file right from Funter and remove it manually. But we recommend you use App Cleaner & Uninstaller, which allows you to uninstall Microsoft Silverlight on Mac with just a few clicks. 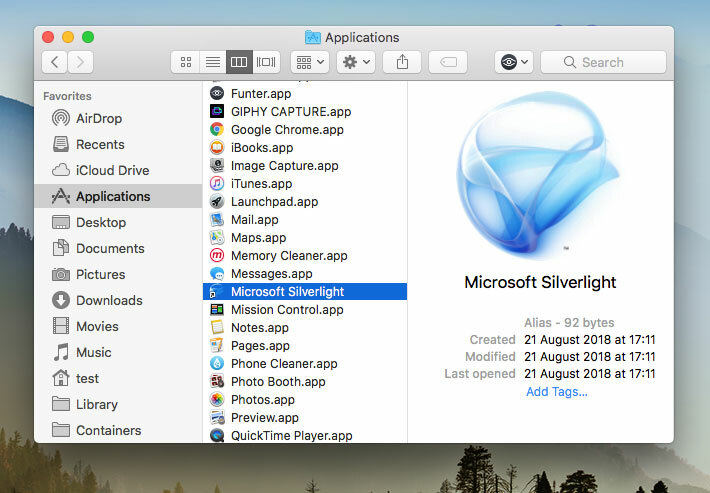 Way 2 – Uninstall Silverlight on macOS with App Cleaner & Uninstaller. 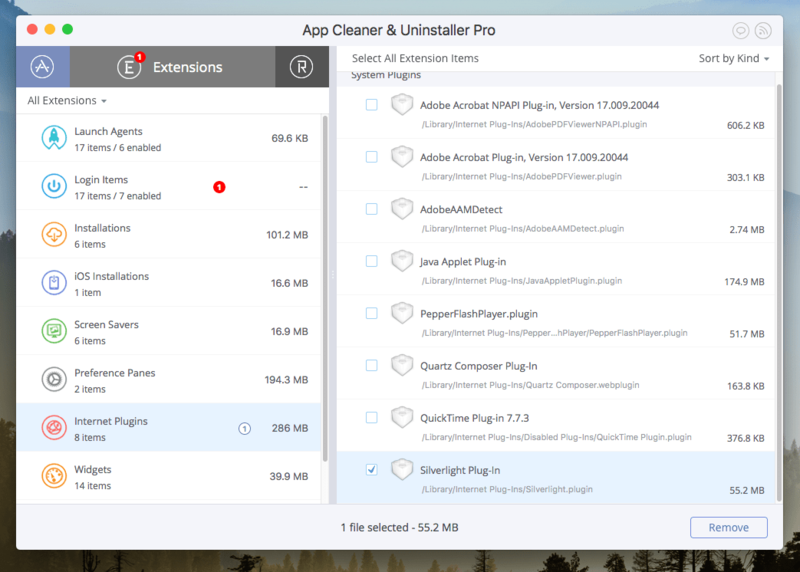 App Cleaner & Uninstaller is a program designed to uninstall apps completely and correctly as well as remove Mac extensions and leftovers of previously deleted apps. It also removes the Silverlight plugin with its service files. Follow the steps below. Go to the Extensions tab and find in the Internet Plugins section the Silverlight item. Select it and click to Remove. 3. Then go to the Applications folder and remove the Silverlight alias file. After this, just empty the Trash. That’s all! As you can see, App Cleaner is a super convenient tool to completely remove any program or Mac extension. You no more have to waste your time searching for the leftovers of the apps.